Medias Moritake (守武　メリヤス Moritake Meriasu) is a penguin youkai and the stage 2 boss of the brilliant route of Brilliant Pagoda or Haze Castle. They are a penguin deployed from a kingdom far to the south. According to JynX, their reason for moving so far away from home was to raise money to feed younger penguin chicks. Medias is a serious and diligent soldier who tries to act mature most of the time. However, their animal instinct shows through when someone mentions fish and do not take kindly when people refer to them as a pet. This ability allows them to move at high speeds without the restraints of friction. This is shown in their attacks, which has them moving very quickly. Their character may be a homage to Momiji Inubashiri , due to them both serving as hard-working soldiers and having a specific animal theme. Their full name is Medias Moritake (守武　メリヤス). Their first name Medias (メリヤス) is a kind of knitted fabric made from a technique similar to the stockinette stitch, which came from Spain and Portugal. Their surname Moritake (守武) can be read as "Shou Wu" in Chinese, with the first character Shou (守) translating to "Keep" and the second Wu (武) translating to "Military", fitting with the fact that they are a member of an army. According to JynX, they got their surname after they were noticed by the emperor. 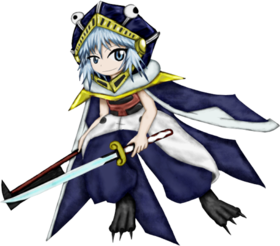 Though the names of many Len'en characters can be linked to various bird species, Medias' name notably contains no such references, despite being a bird youkai themselves; This is explained by JynX that Medias, as a penguin youkai, is merely a flightless bird, and therefore does not have as much significance as those who have a Bird's Name. In the music section of the demo version, the katakana for their first name was written as "メディアス", which appears more fitting for their English name. According to JynX, "Medias" is written as "莫大小" in Chinese. 莫大小, while not a traditional Chinese vocabulary, is a word borrowed from the Japanese to refer to the same kind of knitted fabric. Medias has short light blue hair and eyes. They are dressed in blue and white clothing, a blue cape that resembles penguin wings and an oversized blue hat with eyes and golden ornaments that makes it resemble a penguin head. While a tail is not visible in Medias's in-game portrait, JynX stated that they are able to grow and remove their tail up to their convenience. While Yabusame Houlen and company are flying to the Capital City, they encounter Medias, who seems curious of the trio. Yabusame believes Medias is cute and wants to take them home as a pet penguin. Tsubakura Enraku refuses, since Yabusame is the type of person to dote on something and then get bored and discard it. Shion is jealous of it, since they were already established as the pet of the Senri Shrine and attacks them. After Medias is defeated, Yabusame loses interest and flies away. Medias recognizes Taira no Fumikado as one of the rebellion leaders and ambushes them. Apparently, the penguin used to be their superior in the past, but now Fumikado is a rebel, so Medias tries to capture them and bring them to the Capital City. After the penguin is defeated, Fumikado and their lackeys make fun of their appearance, not believing they are a penguin.